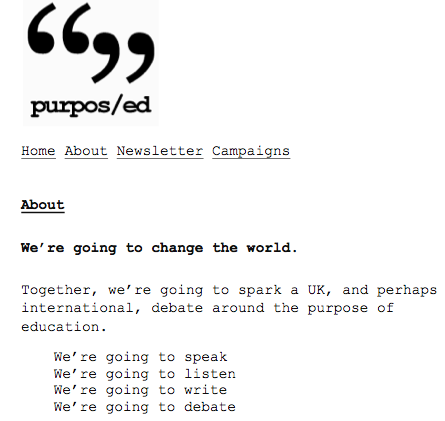 The blog initiative was kick-started on February 1st on the Purpos/ed website, and so far a number of bloggers have contributed in raising their voices and joining the debate. Some of these contributions can be found in the archive, while others may be located by following the hashtags #purposed, and #500words. Furthermore is is possible to connect through a Facebook page. If you have an interest in education this is definitely an initiative worth following. Everyone has the right to education. (…) Education shall be directed to the full development of the human personality and to the strengthening of respect for human rights and fundamental freedoms. It shall promote understanding, tolerance and friendship among all nations, racial or religious groups, and shall further the activities of the United Nations for the maintenance of peace. Education may be a human right, but for many different reasons becoming educated within the existing educational system is sadly not a given. Stephen Downes highlights this in his contribution with reference to his own educational path, and Lou McGill points to the challenges for kids with special needs. Unsurprisingly, many of the purpos/ed contributions echo thoughts similar to those in the declaration, the tricky part is of course how to promote, facilitate, and obtain these goals. Several authors point to new media as a means to broaden the scope of education and to tear down walls whiter these are mental, physical, or virtual. Dean Groom advocates the idea that education should extend beyond the idea of schools/institutions as being the sole places for education, whereas Fred Garnett calls for education aimed at participation. Shifting perspective to my own current research within the 3D virtual world, Second Life (SL), I see a huge potential in using this particular kind of edtech to tear down several “walls”. Ever since I first logged into SL back in the spring of 2007 one of the aspects I’ve come to appreciate most about this virtual world is the participatory affordances enabling both me and my PD-students to connect, communicate, and collaborate with people in general, and educators in particular from all over the physical world. We have been given the opportunity to meet, and discuss cross-cultural differences in education, and to interact with a variety of educational designs – all of this contributing to new perspectives on education, teaching, and learning. 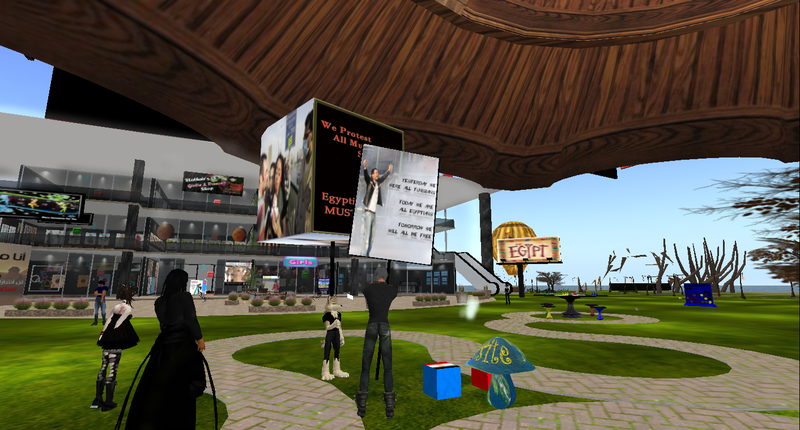 Informal encounters and spontaneous activities are other very positive aspects of SL, and as it is the case in many other new media, the users of SL quickly respond to current affairs – something that recently could be witnessed during the Egypt crisis. Having heard of activities on the Egyptian island I went in to have a look on Friday February 11th shortly before it was announced that Pres. Mubarak would step down.